Autumn At The Arboretum Named One Of "The Best Fall Festivals To Celebrate The Season" By MSN.com! You are here: Home / Dallas/Fort Worth Events / Autumn At The Arboretum Named One Of “The Best Fall Festivals To Celebrate The Season” By MSN.com! Autumn At The Arboretum Named One Of “The Best Fall Festivals To Celebrate The Season” By MSN.com! 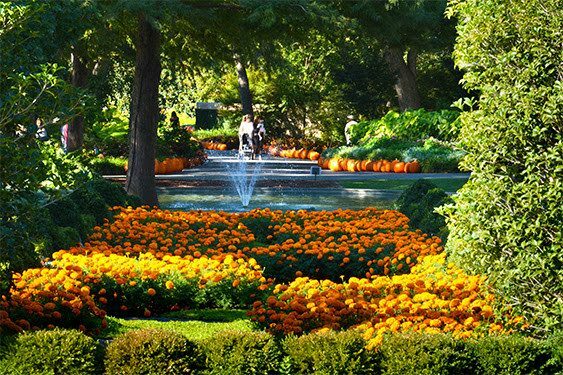 The Dallas Arboretum and Botanical Garden’s Autumn at the Arboretum festival, named one of “The Best Fall Festivals to Celebrate the Season” by MSN.com, continues with a plethora of activities, pumpkins and discounts galore until November 25, 2015. A record 75,000 pumpkins, gourds and squash are used throughout the garden for this fall festival. Autumn at the Arboretum is supported by Alliance Data and Texas Instruments. -The nationally acclaimed Pumpkin Village features four pumpkin houses created from thousands of pumpkins, gourds and squash by the talented Horticulture team. This year’s Pumpkin Village recreates an Old Texas Town including a jail created from decorative corn, a blacksmith, a post office and a general store. -The Texan corral showcases all 52 pumpkin varieties, 16 types of squash and 6 varieties of gourds inside the Pumpkin Village. -Cinderella’s carriage and thousands of pumpkins-artfully arranged throughout Pecan Grove-create popular photo opportunities. –Hay Bale Maze at the Tom Thumb Pumpkin Patch provides discovery and fun for children. -Oktoberfest Garten, 11 a.m.-3 p.m. The quaint, outdoor Café on the Green serves a traditional German menu, while guests enjoy the view of beautiful, full beds of fall color. The DeGolyer House celebrates its 75th Anniversary and the preservation of its historical treasure on the Dallas Arboretum property. Completed in 1940, the hacienda-style home is a celebration of what life was like in the heyday of entertaining. Guests can visit the house and experience its journey from family home to designated landmark through historic photos and documents. Guests can take a picture with their favorite team displayed on a pumpkin. Guests will learn how and why leaves change colors in the fall. Using chromatography, children will pull the pigments out of leaves in the Plant Lab, learning the world of colors to explore. Guests can create a putrid potion (otherwise known as dry ice), and learn how matter shifts from a solid into a gas in the Exploration Center Plant Lab. These days feature a petting zoo, nature crafts, face painting and Kindermusik. Join Dave Forehand, vice president of gardens, as he highlights a section of the Arboretum every Wednesday morning. Additional trams will be available from 9 – 11 a.m. for seniors, available in the Entry Plaza. There is also a special, senior-friendly tour at 11 a.m. on Thursdays, beginning in the Entry Plaza. Guests can learn the process of how watercolor is applied to paper in this introductory class and take home a painting of their own. -Cool Thursdays Concert, Oct. 22, 7 p.m. – 9 p.m. This week features the world’s greatest 80’s tribute band, The Molly Ringwalds, sponsored by Regions Bank, Montgomery Coscia Greilich LLP and McGuire Woods LLP.Gates open at 6 p.m. Food trucks include Gandolfo’s, Texas Burrito and Cup Cakin. Dress in your best 80’s flashback attire for a chance to win prizes. To learn more and to purchase tickets, click here <— . Help the Horticulture staff feed the garden’s aquatic friends every Friday in the Lay Family Garden. Be on the lookout for new koi getting ready to join others soon. Paint a pumpkin in the Pumpkin Village in Pecan Grove. First come, first served. -Harvest Tea, Monday – Friday, through Nov. 25, seatings at 11 a.m. and 2 p.m. Join family and friends for a delicious, three-course seasonal tea service. Guests must be at least 13 years old. Advance reservations required by calling 214.515.6511 or sending an email to [email protected]. -Golden Hours, Tuesday, Oct. 20, 6 p.m. – 8 p.m. The main gardens are open for special after-hours enjoyment and photography. This event is $7 for Members and $10 for non-members and is intended guests to enjoy the garden during sunset. Amateur photographers are welcome. Tickets are available at the gate and parking is included in the admission price. -Wild Kingdom Animal Presentation, Friday, Oct. 23, 1:30 – 2:15 p.m.
Mutual of Omaha’s Wild Kingdom pioneered the narrated nature adventure genre, which uses a knowledgeable host and field correspondents to guide viewers through close encounters with wildlife and wilderness. Guests can join Wild Kingdom host Stephanie Arne in the Arboretum’s Pecan Grove for an up close and personal look at some species that share the wild kingdom with them. Guests can trick-or-treat through the garden with costumed characters and other family fun activities. Children and adults are encouraged to wear festive costumes. A professional photographer will be available to shoot fall family portraits from 12 – 4 p.m.in the Pumpkin Village. Professional photography is an additional cost. A twist on trick-or-treating, children are invited to discover the spooky side of nature by wearing their costumes to the Children’s Adventure Garden to explore the garden in search of the next sticker or adventure at each station. -Live Music, Saturdays and Sundays through Nov. 22, 12 p.m. – 4 p.m. Guests can enjoy live music in Woolf Circle featuring Spanish guitar and recognizable classics. Local duo John Lefler and Camille Cortinas will perform for all audiences with folksy interpretations of classics from the 50’s, 60’s and 70’s. -Yoga for Members, Saturdays through Oct. 31, 7:30 a.m. – 8:30 a.m.
Other activities this week include tadpole feedings, OmniGlobe presentations, story time, scavenger hunts, butterfly tagging, puppet shows and so much more. For a complete list of Children’s Adventure Garden activities and times, click here <— . Tickets can only be purchased onsite and are limited to one per customer. General admission tickets for $11 for those 65 and older along with a 20% discount at the Hoffman Family Gift Store. THIS WEEK, Oct. 22: Watercolor with Gaylord O’Con, Southwest Watercolor Society,9:30 – 11 a.m. Guests can learn the process of how watercolor is applied to paper in this introductory class and take home a painting of their own. Guests can present an admission ticket stub from the 2015 State Fair of Texas and receive $2 off admission, Mondays through Thursdays. Grandparent’s receive free admission when they come with their grandchild. Guests receive 10% off lunch at Restaurant DeGolyer, not including alcohol.